Small business owners are always watching for ways to get ahead of their competition, especially when their business model involves building and distributing a product. Unlike some service-oriented companies, small businesses that create products are often subject to audits in their processes, opinions on intuitive design, and technological upgrades that might render their products obsolete before they even hit the market. Thankfully, entrepreneurs––particularly those seeking capital investors––can give themselves an edge by creating a prototype of their product before launching their next endeavor and evaluating next steps. Before you can determine whether your business needs to develop a prototype, you have to know what prototyping is. In general, prototyping is simply the creation of a functional version of your product that can be used in real-world scenarios that invite reviews, tests, and feedback before you officially introduce your product to the market. Prototypes come in all shapes and sizes in almost every kind of industry. Companies that create everything from tech gadgets to hair products to musical instruments to baked goods can develop a prototype that is then evaluated by a person or group who either represent the ideal customer or have an expertise in the product’s industry. Remember, prototypes don’t have to be made by you directly. If your business venture involves a product that requires more technical know-how or industry-specific expertise, it’s not uncommon to hire a product engineer or someone with more experience under their belt to help you craft the preliminary version of your product. As long as your product maker is equitably compensated and credited, the benefits of building the prototype will set you on the right path of where you want your business to go thanks to the following reasons. You Create Visual Representation and Scalability: Prototypes not only give you a great visual representation of your final product to determine everything you want it to do, but it also allows you to fine-tune and scale your idea once you’ve seen it brought to life. A lot of inventions and business products that seem well thought out in our imagination become more cumbersome and difficult to wield once a prototype is created. However, this isn’t a drawback to prototyping, but a boon. Once you’ve created a prototype, you can see where the kinks are in your product and address them. For that reason, prototyping can be an iterative process, where you work to keep improving on it until you feel it is ready to present to a potential investor or your client base. Investors Want to See the Effort: With that in mind, a prototype of your company’s product is also a major advantage when approaching capital investors or a lending institution. A working model of your product or one that illustrates your ultimate goal will encourage financial resources to take you more seriously than an entrepreneur who approaches them with just a clever idea. A prototype shows potential lenders that your product has been reviewed extensively and possible causes for product failure has been minimized, therefore painting your company as a sound investment. 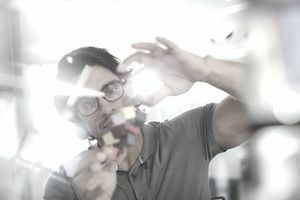 Prototypes Spark New Ideas: The process of building a prototype has the unintentional benefit of also igniting other ideas in your mind that can help jumpstart your business or determine your next entrepreneurial venture. Something about the creative process often opens the mind to ways to improve functionality, reconsider an outstanding issue, or anticipate customer feedback. In prototyping, you have the possibility of walking away with not only a product that can take your business to the next level but also with solutions to problems that previously left you unsure if your company could succeed even with a great prototype in tow. Are Prototypes Right for Your Business? Even the most obscure small business serving the most niche clientele can benefit from prototyping, whether they involve selling vegan cupcakes, mobile apps, or decorative stickers. Prototypes benefit small business owners who know their product has traction, but aren’t sure marketing language and entrepreneurial enthusiasm alone is enough to gain the customer base they need. By building a model of their product, innovative business owners can determine where to direct their time and resources as they begin their venture and move one step closer to success. Should You Buy or Start a Small Business? Which States Offer the Best Business Tax Environment for Corporations? Guide for Immigrant Entrepreneurs Wishing to Move to the U.S.
Equity Financing - Is It Right for Your Small Business?